Cartoon courtesy of Gobbet. Democrats and Progressives need to unite and agree on a program that will unite the country and move the nation forward. Rust Belt or Sun Belt? 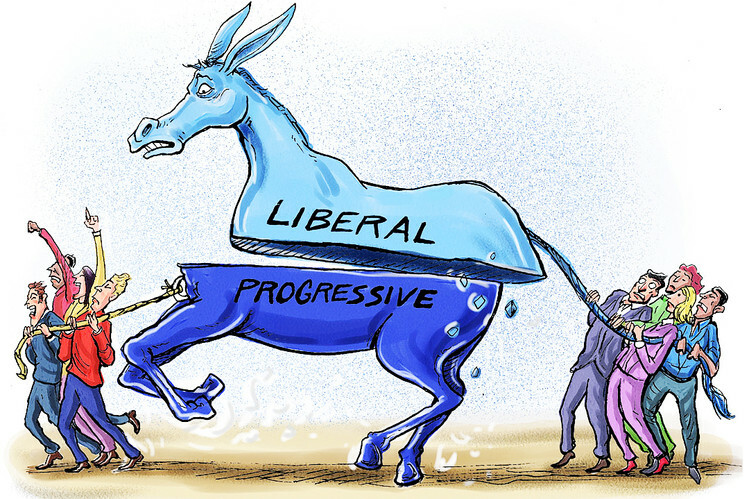 Centrist Democrats or Progressive Democrats? People that voted for Obama twice and then Trump or those that stayed home on election night 2016? 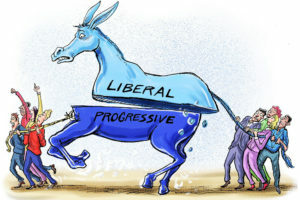 Progressive Democrats of America or Third Way? Which of the above eight doors should Democrats go through in preparing for the 2020 election? In order to become a national party that thrives in all parts of the country, Democrats need to unite and devise a program that appeals to all regions of the nation and every demographic. The Biotech engineer in Phoenix and the unemployed copper miner in Miami-Globe, Arizona want their children to realize and live the American Dream. The rural farmers in Snowflake, Arizona want the same accessible and affordable health care as the urban police officer or firefighter in Tucson. Stay at home mothers in Nogales want the same high quality and affordable educational and child care opportunities for their children as the career woman professional working in Mesa. Hispanic Citizens, like white ones, want safe and secure borders. Both Straight and Gay Families want to live in safe communities. Everyone across the country wants (and needs) to breath clean air and drink uncontaminated water. Everyone also wants to live a comfortable life with a living wage in a free democratic society. Protecting our Democracy, the right to vote, and getting Dark Money out of politics. Equality for everyone including the LGBTQ community. Safe and secure borders by employing sensible and modern methods and technology. While most of these goals are considered by the right wing reactionaries to be socialistic, remember again that the American public supports, with substantial majorities, the passage of these measures. It should also be noted that these measures can be enacted through pragmatic-centrist progressive means by expanding what is already in place. increases in child, hope scholarship and earned income tax credits. Publicly funding state universities and regulating their tuition rate hikes. Stabilizing, reforming, and expanding the Affordable Care Act. Expand Medicaid to include more at a lower poverty level. Have the government negotiate drug prices. As other commentators from other media outlets have relayed, there is no need for Democrats to pick one region over another to campaign in and concentrate on. They should exert and maintain a presence everywhere. There is no one demographic group to target. Democrats should reach out to everyone. There is no one philosophy to solely embrace. There are merits and drawbacks in considering all ideas from the mainstream of the political spectrum. There is no new government program to invent to get the American people what they want and need. The programs already exist and just need to be reformed, expanded and built on. It is time for the Centrist and Progressive Democrats to unite and get the job done. The Trumpists and their allies have given the Center-Left and Left a golden opportunity. Do not blow it on petty squabbling over how far to expand government or which parts of the country to campaign in. There are local, state, and national power centers to contest and win (ifilibuster-proof control of the United States Senate over perennially obstructionist Republicans.) It will not happen if we are divided. I disagree with your use of “divide”. While there certainly are differences saying “divide” sends a much more consequential message than is called for. I think the notion of a divide is largely promoted by television and print media that find conflict a useful marketing device. Unfortunately many of us latch on to such simplistic analyses and use them in our everyday conversations. The real differences among Democrats are ones of priority. Some of us put Climate Change at the top, others put income/wealth inequality, others put universal healthcare, etc. I haven’t found any serious candidates who reject any of these as matters calling for attention. Differences also arise when one discusses solutions but when push comes to shove they all are willing to compromise. The Ocasio-Cortez/Markley “Green New Deal” includes Medicare For All, a Jobs Guarantee, as well as serious efforts to meet the IPCC deadline of twelve (now eleven) years before the effects of irreversible climate change set in. It’s popular and delivers concrete material benefits. So let’s unite around that.